This terraced house, located in the centre of Eupen, was bought by the current owners and intended to serve as a temporary home, in anticipation of finding an appropriate building lot. Since a number of construction works were inevitable as well as urgent measures with regard to the health of their asthmatic son, the step towards passive renovation was rather small and this terraced house would become their permanent home. The owners stress that opting for a passive renovation does not result from energetic, environmental or financial grounds, but from the consideration of their suns health condition. The front facade was insulated continuously from the ground floor plate up to the roof. To ensure this, all existing floor joints at the front facade were literally cut loose and taken over by a new structure, thus eliminating all thermal bridges at this facade. This solution would not have been possible if the facade were insulated on the outside. Moreover, the intervention also allowed the owners to make the front facade completely airtight, since the vapour-proof layer is uninterrupted. Because such a solution would be to complex for the basement, its walls were covered with insulation material up to a certain height to reduce the thermal bridge. 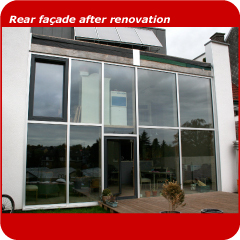 To eliminate the thermal bridges at the front facade windows, new windows were installed deeper into the facade, aligned with the newly applied inside insulation. The existing window openings in the front facade were preserved to maintain its original view. The new roof structures of the annex and the main building were equipped with a thick layer of cellulo	se insulation. A system of balance ventilation with heat recovery was installed. An underground heat exchanger assures the incoming air is heated or cooled in advance. The air is than distributed to the three different zones of the building by three independent circuits. Natural ventilation is also possible by the strategic positioning of top-hinged windows. The system of balance ventilation provides the heating of the different rooms. If necessary the air is post-heated in a decentralized way by means of heating batteries mounted on the supply pipes. The hot water needed for the heating batteries is produced by solar collectors. When the latter do not suffice, a pellet heater is activated. The heating system is also used for the preparation of sanitary hot water. The building is divided into three different zones with separate regulation according to the needs.